We were writing a lot regarding choosing a right vertical, niche and product for promotion, but this time we have decided to dedicate one whole post to traffic share, in order to make your life easier when it comes to choosing the right traffic for promotion our Zetaniche offers: is it mobile or desktop? Under desktop traffic are considered internet users who are sitting behind their desktop computers or laptops, while mobile users are using smartphones, feature phones or tablets. Tablets and Smartphones used to be treated as one in the past. 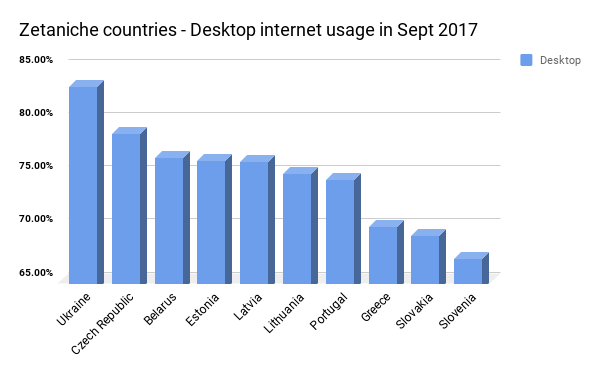 October of the 2016. was the first month ever where mobile usage passed desktop, according to internet monitoring, where the combined traffic from mobile and tablet devices reached 51.2% compared to desktop access which was 48.7%, marking this the first time ever since the beginning of the tracking stats for internet usage. How are stats looking today? 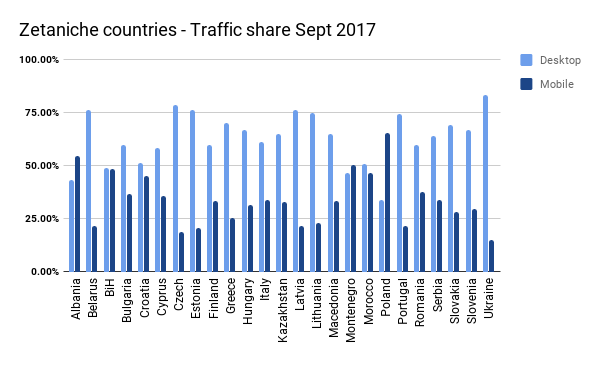 Reports from SimilarWeb are showing that in the last month, September of 2017, from total of 264.0B online visitors worldwide, traffic share between desktop and mobile was: 33.77% for desktop and 66.23% for mobile. It’s more than obvious that mobile is taking over the internet usage game, looking globally, but let’s look deeper into this, from the perspective of our network and promoting our offers through affiliation. Since Zetaniche is always opened for both, direct site owners and affiliates who are working with other traffic channels, it is very important that we mention that affiliates who are owning a website need to optimize their site for all devices. Site needs to be mobile friendly, with regularly positioned ad spots, in order to take the most out of the promoting certain offers. be more likely to return back to the search engine results and to visit another website. And we don’t want any of these situations, right? Zetaniche GEO’s and offers: desktop or mobile? We were writing before about GEO’s Zetaniche is covering and here is the split between mobile and desktop internet usage for the September of 2017 in GEO’s Zetaniche is working with, according to the Stat Counter. The majority of Zetaniche offers are optimized for mobile and desktop, or both. But of course, depending on traffic source offers are performing differently. For example our COD offers are performing great on desktop traffic and they are performing quite well on mobile pages too, but depending a lot more on mobile traffic source. For example, if affiliate is sending mobile traffic from Facebook to COD offers, they will convert great, but if affiliates who are working with paid traffic are sending mobile traffic from some of the mobile ad networks out there to COD offers, they have a chance to not perform that well. What are advantages of working with mobile traffic? Fist and the most obvious reason is that mobile usage is raising a lot compared to desktop and this trends is not showing any signs of slowing down especially in less developed countries. 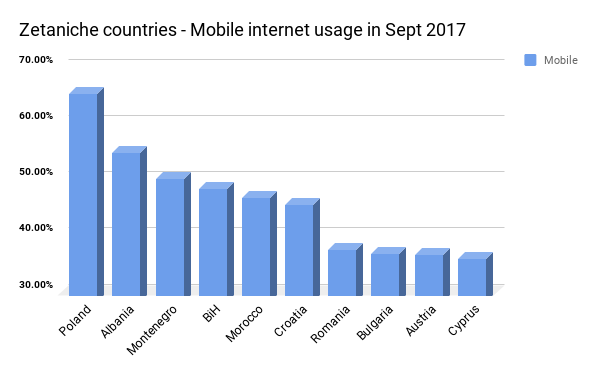 Charts above are showing that among countries we are working with, the biggest internet usage over mobile devices is in Poland (65.18%), Albania (54.68%) and Montenegro (50.04%). For the affiliates who are interested in focusing on less developed countries, mobile is definitely worth of trying. They will get more volumes and these GEO’s are easier to monetize. Second reason is that affiliates can take advantage of offers that are not applying to desktop. For affiliates who are interested in mobile, we have mobile offers only such as PIN submits and mobile subscription offers. What are advantages of working with desktop traffic? When we are talking about the mobile traffic and mobile usage, mobile devices are generally used in more casual situations. People are using mobile devices for social media, chats, playing games, etc. And even if audience can be exposed for certain ads at that time, there is a possibility that they will not be so much interested into buying anything or filling the ordering form over small screen, just because they are not “in a mood for it” while doing casual things and chilling. Of course that buying power over mobile exists, but in some cases desktop simply works better. It’s not rare that audience of certain sites see ads of product browsing over the mobile device, but they will not buy it or order it immediately, rather they will visit the site later over desktop or browse for some more information using their desktop device. Also, one of the big things when it comes to desktop is age of desktop users. First of all desktop devices are easier for usage for older people, especially considering small screens or keyboards of mobile devices. For some of the products Zetaniche is offering for promotion, especially in male enhancement, health and beauty (anti age) niche, older people are known to be better audience. Also, some people just don’t feel comfortable or find it easy to enter their personal data over mobile, but rather use desktop devices for ordering something. We see that top 5 GEO’s were Ukraine (83.10%), Czech Republic (78.66%), Belarus (76.35%), Estonia (76.08%), Latvia (75.99%) and Lithuania (74.86%). In all of these GEO’s we are having various offers that are having great potential for working on desktop traffic. But what is the final choice? If you are interested in promoting our offers that are more appropriate for younger audience, mobile could be better choice. In case you are interested in promotion our only mobile related offers, mobile is your choice, of course. In case you are interested in promoting Zetaniche offers that require older audience, start with desktop, but you can test other channels with mobile, too. In case you are interested in our less developed countries, you should definitely try mobile. But the most important here is, that you should start with both, desktop and mobile. Both of them are making money and focusing only on one platform is a big mistake! Thank you for reading our blog post. Don’t hesitate to leave us a comment below sharing with us your thoughts regarding mobile and desktop platform. Where are you experiencing better results? If you are not part of Zetaniche yet, join us today and start promoting our desktop and mobile offers. Your AM will gladly help you with setting up everything!